Traffic breakdown leading to the onset of congestion in a traffic network occurs usually at a network bottleneck. Road bottlenecks are caused, for example, by on- and off-ramps, road gradients, roadworks, a decrease in the number of road lines (in the flow direction), traffic signal, etc. 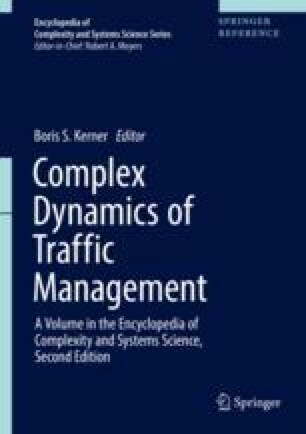 The BM principle states that the optimum of a traffic or transportation network with N bottlenecks is reached when dynamic traffic assignment, optimization, and control are performed in the network in such a way that the probability Pnet for the occurrence of traffic breakdown in at least one of the network bottlenecks during a given time interval Tob for observing traffic flow reaches the minimum possible value. The BM principle is equivalent to the maximization of the probability that during the time interval Tob, traffic breakdown occurs at none of the network bottlenecks. I would like to thank Sergey Klenov and Hubert Rehborn for the help and useful suggestions. I thank our partners for their support in the projects “UR:BAN – Urban Space: User oriented assistance systems and network management” and “MEC-View – Object detection for automated driving based on Mobile Edge Computing,” funded by the German Federal Ministry of Economic Affairs and Energy.